The conundrum of spring cleaning is that it occurs during mud season. Mud tracks. And when it dries it travels in the stealthy form of dirt. Once the monumental task of scrubbing each and every board on every single floor is done, you don’t want anyone to walk on them. At least for a week, if not forever. It’s not polite to glare at someone’s shoes when they come in to say hello, but in shameful honesty, experience has shown this simple situation can wake the dormant beast even in the best of hosts. Especially if the oh-so-slim slot available for cleaning in your weekly time-budget has been taken up by those oh-so-inevitable incidentals that pop up out of nowhere—at the precise moment you were reaching for the mop. Then all at once on that appointed beautiful, early spring morning, you find yourself staring in horror at the accumulated results of a winter’s worth of cleaning Saturdays that never happened. Their fall-out lies in drifts in every nook and cranny of the house. Little piles of procrastination, pushed into closets and stuffed into crevices you didn’t even know existed, peering up at you blankly, innocently. Clutter is sly, and dirt is ingenious. The only courageous thing to do is smile through your teeth and keep sweeping. And if all else fails, head for the dump. Some of the beauties of a small town is that they have their own post offices and often still, a library. Not least importantly, they also have a transfer station, more commonly referred to as “The Dump.” You can of course opt for curbside pick-up. But our town offers free access to its transfer station on not only one, but three convenient days of the week. Not to mention that it is run by our enthusiastic and devoted dump manager, Wayne. Having waited tables for a good portion of my life, I’m acquainted with how well the seam of wit and patience must be sewn to keep from fraying. Wayne is at home with that skill and hosts our dump with humor and discipline. He is a veteran, and also an artist and philanthropist at heart. To the left of the recycling station, Wayne has built a Gallery of Trash and Treasure, while to the right, returnables are sorted into bins and proceeds are collected to benefit the monthly charity of choice. And then, of course, there is The Shed, where all cast-offs still in fine condition are put up for grabs. I have found many a useful and unique item there, to furnish or fix parts of the house. As children, my siblings and I would pile up on the bench seat of my father’s blue Ford pick-up for the weekly dump-run from our little summer cottage. Just before the recycling impulse of the 1970s, the haphazardly separated piles of trash were a wonder to behold each time we pulled through the gates. A plethora of what we four imaginative collaborators deemed “potential” lay entirely unfenced in semi-sorted heaps of metal, wood, and plastic before our eyes. The truck-bed would be emptied and our father would be deep into discussion at the bottom of the 9th of last night’s game. During this time, anything that still had wheels, character, or breath left to defend itself against the compactor, would have efficiently been loaded by us, right back into the truck. My father humored us and more often than not, what really was meant to stay would make it back the following week, anyway. Town dumps were a place where locals could meet up and exchange their views on politics, catch up on gossip, or simply say hello. They still are, in part. The other side of taking your trash to the dump is that as you toss your bags and recyclables in their proper places you get a glimpse of how much waste just one little town produces. The view gives you a larger perspective, no matter how efficiently it’s sorted. Trash is our common denominator. We all have it, and we all make it. Then, we have to get rid of it. And it’s not a pretty picture, whether you toss it into a compactor yourself, or push it neatly packaged, to the curb. 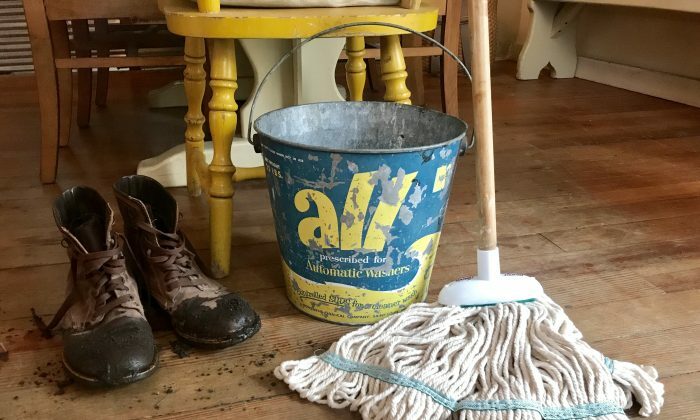 I have a soft spot for our local dump, but as I grab the mop today and fill the bucket, I’m thinking a lot about spring cleaning from a different perspective—starting from where the mess begins. How do I measure better, what I really need to accumulate, both in my heart and in my home, and what I really don’t? How to temper not only what I do, but what I say, because both have a residual impact. And how to try to make it good, worthwhile, and of clean substance because I may decide to dump, transfer, or destroy it down the line. And how to graciously lighten the present load, in a world already burdened by an overwhelming excess of all of the above, without simply adding it to someone else’s. Mopping is beginning to look like the simplest thing to do, today. And smiling, even if someone forgets to take their shoes off, is a good way to start. I want to think that somewhere in this world of technological convenience, the software of the heart will have a conversation with the head. The sugar maple, hands down, is the certain hero of an otherwise fickle month. At times it can feel easier to teach our children advanced calculus than to convince them to clean up after themselves.